Posted May 3, 2017 by Bailey Heard & filed under Blog, FeaturedOnHomePage. One of the greatest tragedies in life is to be alive, but not really living. As I’ve experienced over the past couple of weeks, sometimes our fears and anxieties about the things we can’t control in life keep us locked up in a self-made prison of merely existing and going through the motions of each day. In an earlier post, I shared how over the past few months I’ve been experiencing some serious chest pains. I appreciate all of the messages, comments, and feedback from those of you who expressed you’ve had similar experiences and I kept all of it in mind during my search for answers. After being cleared by a cardiologist I was sent to a GI specialist, who told me it sounded like a heart aneurysm or gallbladder issues. He scoped my esophagus and it was evident I had a bad case of acid reflux. He wrote down the name of a possible pre-cancer diagnosis on the images, which sent me into a panic. He biopsied some places in my esophagus and sent me to get a CT scan of my stomach and chest. To say I’ve been a little fearful and anxious would be an understatement. As most of you know, we lost my husband, Andrew, to cancer only four years ago this July. So of course, my emotions were heightened and my mind went to the worst possible scenario. It was all I could think about. I didn’t eat much or sleep well. In the midst of doctors’ appointments, blood work, a day surgery, and a CT scan, I found out that my TEDx talk was approved by the TEDx Talk organization and uploaded to their YouTube channel: https://youtu.be/f2icabWsRgk. Such is life. Mountain-top moments while being in a valley. I don’t like to watch videos of me speaking, as I find I can be my worst critic, but for some reason I made myself watch my TEDx talk. I honestly needed to hear my own message again. Listening to it, I was reminded of the choice I had in the face of results I couldn’t control. I could choose courage even though I was afraid. I could choose my response to this whole situation. I realized although I didn’t know the future, I was alive today. I’ve seen how short and precious life can be and I didn’t want to allow fear to cripple me from experiencing the Now. So I focused on what I could do and chose to believe God is in control. Life doesn’t stop when our world is turned upside down. 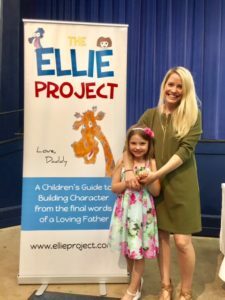 I still had another speaking event last week and a young daughter who needed me to be present. Ellie and I headed to stay with Andrew’s parents while I spoke in a town close by. Although at first my mind was preoccupied with my health, I was quickly comforted talking to Andrew’s dad. He’s a doctor and was able to give me more insight into the possible diagnosis. Our conversation brought me some peace of mind and I realized I had a high likelihood of making a full recovery. Spending time with Andrew’s family, the people who were in the trenches with me during the most challenging times of Andrew’s battle with cancer, and getting to speak in one of the towns that helped support our family during the whole experience, helped me to regain a higher perspective on life and my situation. “Sometimes we must look at things from a higher perspective to see what’s really going on.”- Andrew B. Heard, “G for Giraffe,” The Ellie Project. I’ve missed connecting with you over the past couple of weeks and I’m thankful that you chose to spend some of your time with me today! Love and Blessings. PS – Thank you so much to Accolade Hospice for having me out to speak in Yoakum, TX, last week! It was a pure pleasure and I enjoyed meeting each and every one of you! PPS- If your were encouraged through my TEDx message and you think others would received value from it I would be so grateful if you would pass the video along to your friends, family, FB communities and other social media outlets. So many of you have already done so and I really appreciate it! Thank you for sharing this ordeal you are going through. My husband is having some health issues of his own and we are waiting to see how it plays out. Waiting is hard and causes anxiety. Once we know for sure, we will tackle it or breathe a sigh of relief. Praying for the latter, but reminding ourselves that God is in charge and we are in good hands. Thank you for your blog and I will be praying for your sigh of relief. God’s peace be with you. Hi Caraleen! I’m so sorry to hear about your husband’s health issues. what you shared is exactly how I feel. Thank you so much for sharing this with me. It really encouraged me and I will be praying for your husband’s health. Please keep me updated on how I can be praying. Truly appreciate your prayers. Blessings Caraleen. Your talk was wonderful, Bailey! Thank you for sharing your story!! I will be praying for peace as you get your test results. Hi Jessica! Thank you so much for coming! The pleasure was truly all mine. Thank you so much for your prayers! Blessings Jessica. Andrew’s book spoke volumes of wisdom and I am betting you are going to be just fine? ?